The U.S. and its allies have long been complicit in the manufacturing and use of biological and chemical weapons, yet has targeted other countries for alleged possession and use of these same weapons. This partial chronology is intended as a starting point for critical research and analysis of bio-chemical weaponry and foreign policy. 400s B.C. : Spartan Greeks use sulfur fumes against enemy soldiers. 256 A.D.: Sasanian Persian Empire may have used toxic smoke against Roman soldiers in a tunnel in modern-day Syria. 1346: Tatars catapult plague-infected corpses into Italian trade settlement in Crimea. 1500s: Spanish conquistadors use biological warfare used against Indigenous peoples in the Americas. 1763: British Gen. Jeffrey Amherst advocates use of smallpox blankets against Native peoples during Pontiac’s Rebellion. Smallpox blankets given to Native delegates during talks at Fort Pitt. 1789: Smallpox ravages Australian Indigenous communities in New South Wales; debate persists whether the British deliberately introduced it. 1800s: Smallpox, measles, and other diseases ravage Native American and First Nation communities; U.S. and British/Canadian officials use quarantine techniques to isolate diseases in white communities, but not in Native villages. 1845: British attack Maori resisters with poison gas in Battle of Ohaeawai, Aotearoa/New Zealand. 1914-18: World War I begins; Germans introduce chlorine gas at Second Battle of Ypres. 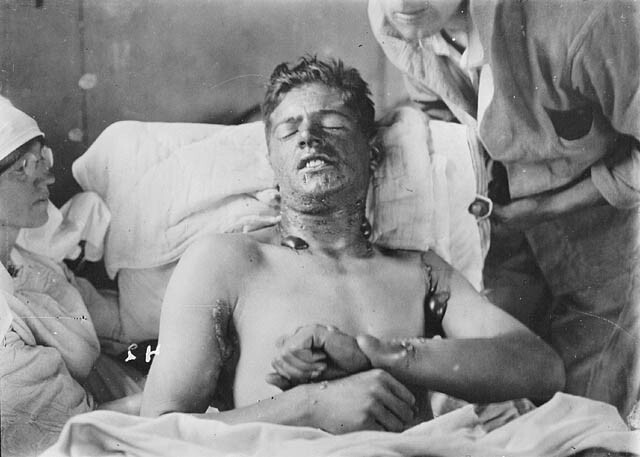 Poison gas such as mustard gas and chlorine gas produces 85,000 deaths, 1,200,000 injuries on both sides. 1919-21: Poison gas used in Russian civil war, against rebels by the Bolsheviks, and against Bolsheviks by the Royal Air Force. 1920s: Spanish and French forces use mustard gas against Berber rebels in Spanish Morocco. Britain proposes use of chemical weapons in Iraq “as an experiment” against Arab and Kurdish rebels seeking independence; Winston Churchill “strongly” backs the proposed “use of poisoned gas against uncivilised tribes,” which was apparently not carried out. 1928: The Geneva Protocol (first signed in 1925) by the League of Nations prohibits gas and bacteriological warfare; most countries that ratify it prohibit only the first use of such weapons. 1937: Japan invades China, widely uses chemical weapons in war to conquer China, and used biological weapons such as plague-carrying fleas. 1939: World War II begins; both sides decide not to use bio-chemical arms in large-scale attacks, due to fears of retaliation in kind. 1942: German forces may have used poison gas against Soviet resisters in tunnels during the Battle of Kerch in Crimea. 1943: U.S. ship damaged by German bombing raid on Bari, Italy, leaks mustard gas, killing 1,000. 1945: When concentration camps are liberated, inmates report that Germans have used Zyklon-B in the extermination of civilians. Japanese military discovered to have conducted biological warfare experiments on POWs, killing 3000. U.S. shields officers in charge from war crimes trials, in return for data. Soviets take over German nerve gas facility in Potsdam. The Nazis had stockpiles of nerve gas against which the Allies had no defenses, and had also been working on blood agents. 1949: U.S. dismisses Soviet trials of Japanese for germ warfare as “propaganda.” Army begins secret tests of biological agents in U.S. cities. 1950: Korean War begins; North Korea and China accuse U.S. of germ warfare–charges never proven. San Francisco disease outbreak matches Army bacteria used on city. 1951: African-Americans exposed to potentially fatal simulant in Virginia test of race-specific fungal weapons. 1954: Fort Detrick in Maryland initiates Operation Whitecoat to research the effects of biological agents on soliders and conscientious objector volunteers; program lasts until 1973. 1956: Army manual explicitly states that bio-chemical warfare is not banned. Rep. Gerald Ford wins policy change to give U.S. military “first strike” authority on chemical arms. 1963-66: US, UK and Israel accuse Egypt of using chemical weapons during its intervention in North Yemen’s civil war. 1969: Utah chemical weapons accident kills thousands of sheep; President Nixon declares U.S. moratorium on chemical weapons production and biological weapons possession. U.N. General Assembly bans use of herbicides (plant killers) and tear gasses in warfare; U.S. one of three opposing votes. U.S. forces cause tear gas fatalities in Vietnamese guerrilla tunnels, and widely use napalm (jellied gasoline that stick to skin). 1971: U.S. ends direct use of herbicides such as Agent Orange; had spread over Indochinese forests, and destroyed at least six percent of South Vietnamese cropland, enough to feed 600,000 people for a year. Diseases and birth defects affected Vietnamese civilians and U.S. veterans. White phosphorus grenades also used against South Vietnamese rebels. U.S. intelligence gives swine-flu virus to anti-Castro Cuban paramilitary group, which lands it on Cuba’s southern coast (according to 1977 newspaper reports). 1978: Bulgarian secret service uses ricin in umbrella tip to assassinate Bulgarian dissident in London. 1979: Anthrax leak from Soviet biological weapons lab kills 60 near in the Ural Mountains of Russia, near Sverdlovsk. Washington Post reports on U.S. program against Cuban agriculture since 1962, including CIA biological warfare component. White government of Rhodesia contaminates Africans with anthrax in the last stages of the Zimbabwe independence war, resulting in 10,000 cases, 182 of them fatal. 1980: U.S. intelligence officials allege Soviet chemical use in Afghanistan, while admitting “no confirmation.” Congress approves nerve gas facility in Pine Bluff, Arkansas. Iraq begins eight-year war with U.S. arch-enemy Iran; both sides use chemical weapons in the war. 1981: U.S. accuses Vietnam and allies of using mycotoxins (fungal poisons) in Laos and Cambodia. Some refugees report casualties in Laos; one analysis reveals “yellow rain” as bee feces, but questions remained. 1988: Iraq uses chemical weapons against Kurdish minority rebels and civilians in Halabjah, killing at least 5,000. U.S. continues to maintain agricultural credits with Iraq; President Reagan blocks congressional sanctions against Iraq. 1991: U.S. and Coalition forces invade Kuwait and Iraq in the Gulf War; Iraq possesses chemical weapons but does not use them. At least 28 alleged bio-chemical production or storage sites are bombed in Iraq during the Gulf War, including fertilizer and other civilian plants. CNN reports “green flames” from one chemical plant, and the deaths of 50 Iraqi troops from anthrax after air strike on another site. New York Times quotes Soviet chemical weapons commander that air strikes on Iraqi chemical weapons would have “little effect beyond neighboring villages,” but that strikes on biological weapons could spread disease “to adjoining countries.” Czechoslovak chemical warfare unit detects sarin nerve gas after air strikes on Iraqi chemical weapons facilities. Egyptian doctor reports outbreak of “strange disease” inside Iraq. After the war, U.S. troops use explosives in Khamisiya to destroy Iraqi chemical weapons storage bunkers. 1992: Reports intensify of U.S. and Coalition veterans of Gulf War developing health problems, involving a variety of symptoms, collectively called Gulf War Syndrome. U.N. sanctions intensify civilian health crisis inside Iraq, making identification of similar symptoms potentially difficult. Two members of anti-government Minnesota Patriots’ Council arrested for plan to use ricin chemical against law enforcement officer. 1993: President Clinton continues intermittent bombing and missile raids against Iraqi facilities; U.N. inspectors step up program to dismantle Iraqi weapons. U.S. signs U.N. Chemical Weapons Convention, though approval later blocked in Senate. 1994: Russian forces extensively use white phosphorus shells as incendiary weapons in Chechnya. 1994-95: Japanese cult Aum Shinrikyo launches deadly sarin nerve gas attacks on the Matsumoto community and on the Tokyo subway system. 1996: Congressional hearings on Gulf War Syndrome focuses on Iraqi storage bunker destruction, rather than other possible causes, and does not call for international investigation of symptoms among Iraqis. CIA investigation asserts that U.S. bombing of chemical weapons sites did not contaminate population. 1997: Cuba accuses U.S. of spraying crops with biological agents. Iraq expels U.S. citizens in U.N. inspection teams, which are allowed to continue work without Americans, but choose to evacuate all inspectors. U.S. mobilizes for military action. Senate act implements Chemical Weapons Convention, with a provision that “the President may deny a request to inspect any facility” on national security grounds. 1998: Chief UN weapons inspector Richard Butler orders inspectors out of Iraq just prior to U.S. bombing. In Operation Desert Fox, Clinton again bombs alleged Iraqi bio-chemical weapons sites, after Iraq questions role of American U.N. inspector, and restricts inspector access to presidential properties and security. U.S. launches missile attack on pharmaceutical plant in Sudan that it alleges produces nerve gas agents–a claim disputed by most of the international community. 1998-99: Series of anthrax hoaxes against U.S. media and government targetss. Ex-Aryan Nations member Larry Wayne Harris carries out anthrax hoax to dramatize warning of alleged “Iraqi threat.” Three members of Republic of Texas militia group arrested for intention to use anthrax and other biological agents against public officials. Upsurge in anthrax hoaxes against abortion clinics. 1999: NATO bombs Yugoslavia in Kosovo Crisis, triggering massive Serbian expulsion of ethnic Albanians. NATO bombers hit a Serbian petrochemical plant in Pancevo, sending a toxic cloud with 2,000 tons of chemicals over the city, and chemicals were released in other bombings of industrial plants. 2000: “Topoff Exercise” involving federal and state authorities fails to cope with simulated chemical, biological and nuclear attacks in three widely separated metropolitan areas. 2001: U.S. withdraws from the first round of Biological and Toxic Weapons Convention (BTWC), crippling international efforts to establish global measures against biological weapons. In wake of September 11 attacks, anthrax spores sent by mail to multiple political and media targets around the U.S., resulting in anthrax exposures, infections, and at least 5 deaths. Real anthrax attacks accompanied by increase in anthrax hoaxes by “Army of God” and other groups and individuals. 2002: Russian police use chemical gas against Chechen rebels holding hostages in Moscow theater; 42 rebels and 120 hostages died from the gas raid. Bush Administration renews allegations that Iraq possesses biochemical weapons (drawing on allegations by Iraqi exiles), reluctantly acquiesces in return of United Nations weapons inspectors (after four years of absence) to prove or disprove the claim. Chief UN arms inspector Hans Blix reports no evidence of renewed chemical or biological weapons programs in Iraq. 2003: UN inspectors find evidence of Iraqi violations of ballistic missile range limits, and begin to destroy missiles. Bush Administration not satisfied with extent of UN inspection. Just prior to U.S.-U.K. invasion of Iraq, UN orders inspectors out of country. After invasion, U.S. contends it will hunt for Weapons of Mass Destruction on its own, and finds none. As a member state of the UN Security Council, Syria proposes a WMD-Free Zone in the Middle East, which the U.S. rejects. 2004: During the First Battle of Fallujah, U.S. forces use white phosphorus artillery shells (intended for aerial illumination) as an incendiary weapon against Iraqi insurgents, killing and injuring many civilians. Pentagon finally admits in 2013 its use of white phosphorus as a weapon in Fallujah. Environmental justice protests in Anniston, Alabama oppose incineration of chemical weapons in populated area. 2007: Al-Qaeda in Mesopotamia carries out chlorine gas tank bombings in Iraqi civil war. White phosphorus train derails in Ukraine, contaminating 90 sq km. 2008: Israel uses white phosphorus shells during its three-week war against Palestinians in the Gaza Strip. U.S. government employee suspected in 2001 anthrax attacks commits suicide. 2009: Taliban and U.S. forces accuse each other of using white phosphorus as weapons. Rebels in Yemen accuse Saudi warplanes of dropping white phosphorus. 2011: Some news sources report white phosphorus use by NATO forces in Libya. Four militia members arrested in Georgia for plotting to use ricin to attack politicians, media, and the IRS. 2012: U.S. has closed 7 of 9 chemical weapons depots and destroyed 90 percent of its stockpiles, to meet the provisions of the Chemical Weapons Convention it signed in 1993. Israel hits UNRWA compound in Gaza City with white phosphorus; announces the following year that it will stop using white phosphorus weapons. 2013: Actress allegedly mails ricin mailed to the President and other U.S. leaders. In January, UK issues licenses to export chemicals to Syria that could be used to make sarin; licenses revoked when sanctions begin against Syria in July. Syrian government and rebels trade accusations of using sarin in April and August. Doctors Without Borders documents 355 killed in August sarin attack in Ghouta area; Secretary of State John Kerry claims that Syrian government is responsible for killing 1,429 Syrians. UK declines to back military strikes on Syria; France, Turkey, Saudi Arabia, and Israel back U.S. military action. List compiled in 1998, 2003, and 2013 from articles in Z magazine by Stephen Shalom (“Bullets, Gas, and the Bomb,” Feb. 1991), Zoltan Grossman (“Ecocide in the Gulf?,” March 1991), Council for a Livable World, Organization for the Prohibition of Chemical Weapons, National Geographic, William Blum’s Killing Hope: U.S. Military and CIA Interventions Since World War II, and from news reports and Wikipedia timelines. Thanks for Stephen Shalom for comments.